Ten sets of color-coded wooden sticks ranging from 2 to 20 centimeters and a special set of sticks in natural wood, in a wooden compartmentalized box. The box also contains curved sticks, a measuring angle made of plastic, a plumb line and fasteners. The cork work board (not included) is also needed with this material. Geometric Stick Material The Geometric Stick Material is used in the elementary classroom for the study of lines, the measurement of angles, and the construction and analysis of plane geometric shapes. 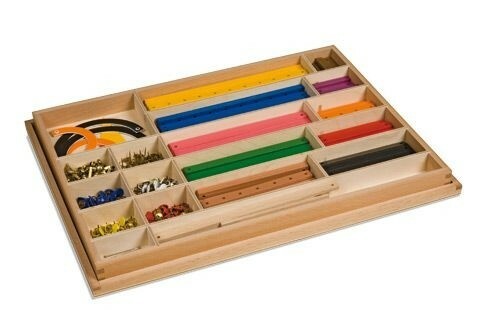 Consists of a series of color-coded sticks, plastic curves, a plastic measuring angle, a plumb line, tacks and brad fasteners, all stored in a compartmentalized wooden box with lid.